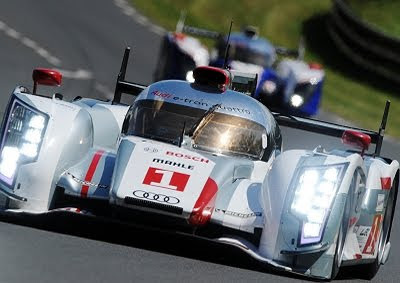 Audi claimed the first Le Mans 24 Hours victory for a hybrid car as #1 crew Andre Lotterer, Benoit Treluyer and Marcel Fassler repeated their 2011 triumph in the 80th running of the famous event. The trio led a one-two for the new e-tron quattro and topped an all-Audi podium. Toyota exceeded expectations with its pace and Audi allowed its drivers to push each other to the limit in a battle from which none of the combatants could get through totally unscathed. None suffered as big an accident as Toyota man Anthony Davidson though, with the Briton sustaining two fractured vertebrae in a horrifying clash with a GT car. The #1 Audi was the only one of the team's four cars not to run into moderate trouble in the opening hours, as both ultras needed precautionary garage visits for checks, and the sister #2 e-tron had to pit to remove a large amount of rubber build-up that was interfering with its suspension. That allowed the impressively quick Toyotas to take the fight to the #1 Audi, and near the end of hour five Toyota's Nicolas Lapierre was going wheel-to-wheel with Audi's race leader Treluyer in a spectacular side-by-side dice from which the TS030 emerged on top. But just as it did so, the television cameras cut to the sight of the wreckage of the sister #8 TS030, which had flipped through the air and slammed into the barriers after contact between Davidson and AF Corse Ferrari GTE Am driver Piergiuseppe Perazzini on the approach to Mulsanne corner. A long safety car period followed while Davidson was extricated and the crash barriers rebuilt following violent assaults from both the Toyota and Ferrari. Toyota lost the lead in the pitstop during this caution, and then saw its starring run all but ended at the restart when Kazuki Nakajima clashed with the DeltaWing, ending the experimental car's promising race and forcing the Toyota into its garage for extensive bodywork and floor repairs. An engine failure then stopped the car just before half-distance.